Cave and karst conservation is at the heart of SPG’s community outreach education programs. Because caves are time capsules of geological and biological history, cave conservation begins with protecting both geological and biological resources. Caves are brimming with delicate, fragile ecosystems that must not be harmed by water pollution from the surface nor abuse from human visitors. Disrupting just one link in the cave’s food chain could disrupt the entire ecosystem. Some cave species are found in just one cave! Karst conservation also means protecting the quality and quantity of the groundwater. Take too much from one place and wells go dry. Anything dumped on the ground will leach into the groundwater sooner or later. Want to drink polluted water? No? Want your family or neighbors to drink or bathe in polluted water? 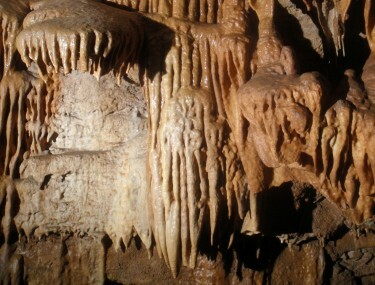 As it turns out, water quality is important for us, as well as the ecosystems within caves that depend on groundwater. Presentations at schools, civic organizations, public venues, such as the Springfield Nature Center. Guided educational cave tours – From April 1 to November 15, We give students opportunities to get muddy, but mostly we teach them about caves, caving safety and cave conservation. Interpretive signs – SPG has helped author and construct interpretive signs in the Ozark National Scenic Riverways and Ha Ha Tonka State Park. April 29, 2016 Annual Junior Ranger Day, Alley Spring, MO. The National Park Service will host 300-400 elementary school students for a fun day of learning about nature. SPG and Cave Research Foundations members will man a booth on caves that will be one of many booths students will be visiting during the day. If you are interested in having the Springfield Plateau conduct an educational presentation about caves and karst exploration, conservation or education or a guided cave tour for your civic organization, school class, scout troop or other group, contact us to discuss how we can help.